Autumn Leaves by Nikki Van De Car was finished just in time for Eleanor coming home from university for the weekend. I knit this pretty little cardigan for her friend's baby and thought she'd be seeing her whilst she was here so I got a spurt on to get it finished, but as it turned out, she didn't get chance. Never mind, she'll be able to pass it on, along with the Knit Baby Jacket, when she comes home again for Easter. It's called Autumn Leaves but I think it's more of a spring and summer cardigan with it having short sleeves. I knit the 6-12 months and I love the colour, I think it'll be perfect for the summer months when the baby will have grown into it. It gets its name from the leaf pattern around the yoke. Instead of ribbing, seed stitch is used along the edges. I think it's a lovely finish. Eleanor's friend has been thrilled with the things I've made her so far. It makes it all worthwhile when your knitting is so appreciated. TV and film that I've been enjoying this month. 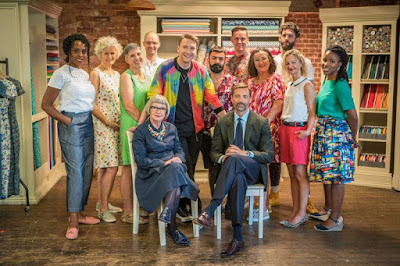 A new series of The Great British Sewing Bee has started. I thought they'd had a year off but it has actually been away from our screens for two years and I know so many people who enjoy it so it's definitely a good show to revive. The comedian Joe Lycett has taken over from Claudia Winkelman as host and he's doing a great job. There's some very talented contestants again this series, it's hard to pick out who the winner is going to be. One of my favourite programmes is Gogglebox. I was quite late coming to this, the first series was aired back in 2013 but I've only been watching for a couple of years. 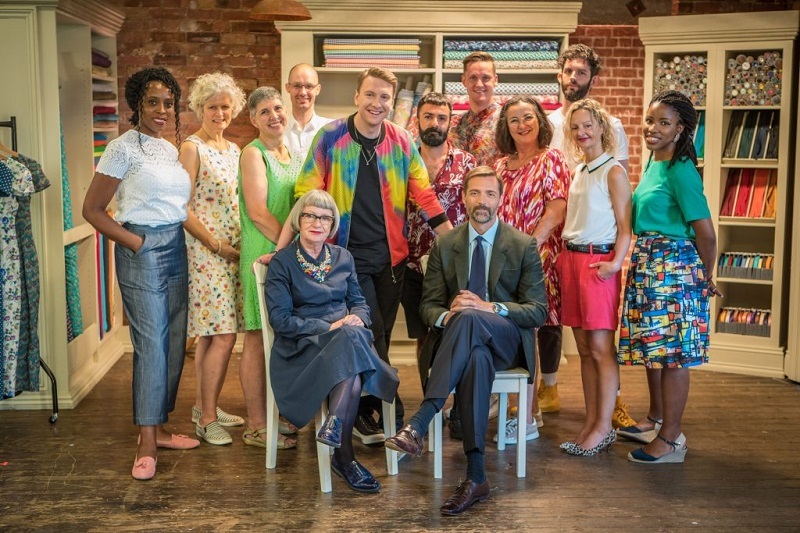 If you're not sure what this show is about, it's basically different families and groups of friends from different locations in the UK watching a selection of television programmes and reacting to them. I love it. I'd heard about Making a Murderer but didn't really know what it was all about so when I got my Netflix trial, I decided to give it a go. 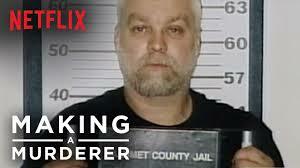 I really enjoy true crime documentaries, especially those which show the legal proceedings as Making a Murderer does. Oh my goodness, it had me hooked. Steven Avery served 18 years of a 20 year sentence for sexual assault and attempted murder before being exonerated and released. Two years later he was arrested and convicted, along with his teenage nephew, for an unrelated murder, a crime which they both maintain they did not commit. The first season chronicles the period between 1985 and 2007, the original arrest and conviction, Avery's exoneration and release, the 2005 arrests, and the ensuing trial and convictions in 2007. After watching that I couldn't wait to start season two, which follows the appeals process as Steven Avery and Brendan Dassey try to overturn their convictions. I had all twenty episodes of Making a Murderer finished in no time at all, it was compelling viewing. Eleanor's home from university for the weekend. It's quite rare that she comes home in between holiday periods so we've been making the most of it and spending some lovely time together. 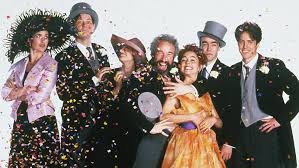 We decided to watch a film last night and opted for Four Weddings and a Funeral. We've all seen it many times before but it's one of those films you can watch over and over again, though it is looking quite dated now having been made twenty five years ago. Have you been watching any of these? What else have you been watching this month? I wrote about my current planning system recently in A Planning Update post. I touched on the journal that I keep at the moment but I did hint that I was going to change things a little. I've kept a journal on and off for a long time. I used to try to write in a diary every day but I never kept up with it and the empty pages which I hadn't filled in would put me off continuing with it, and so eventually, I found that using an undated journal worked best for me. The journal I keep now was started back in 2006. It's just a plain old A4 size lined note book and I write in it as and when I have something to say. That's got a lot more frequent over the last few years as I gained more time for myself, so I've decided to go back to a dated diary and try writing on a daily basis again. Sucked in by posts on Instagram and videos on You Tube, I've fallen on the Hobonichi bandwagon. 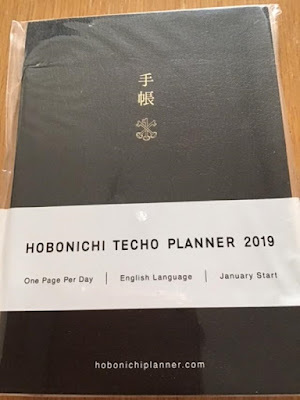 A Hobonichi Techo is a planner notebook, though I'm happy in the way I use my Filofax for planning so I won't be using it as such, it will just be used as my journal. One of the things I like about it is its size, it's a compact A6 which I think will give me just the right amount of space. There's a page dedicated to each day which is enough when I've got something to say but not too much to overwhelm me. 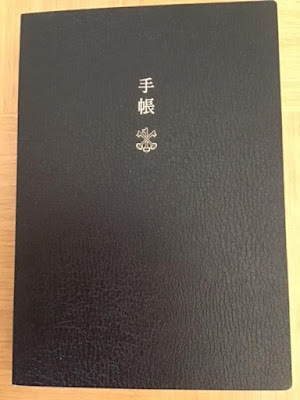 The pages are printed on Tomoe River Paper which is incredibly thin. This helps keep the book compact enabling one whole year to fit in one small planner rather than in separate books. This paper is bleed resistant meaning that I'll be able to use my fountain pen without the ink showing through onto the next page. 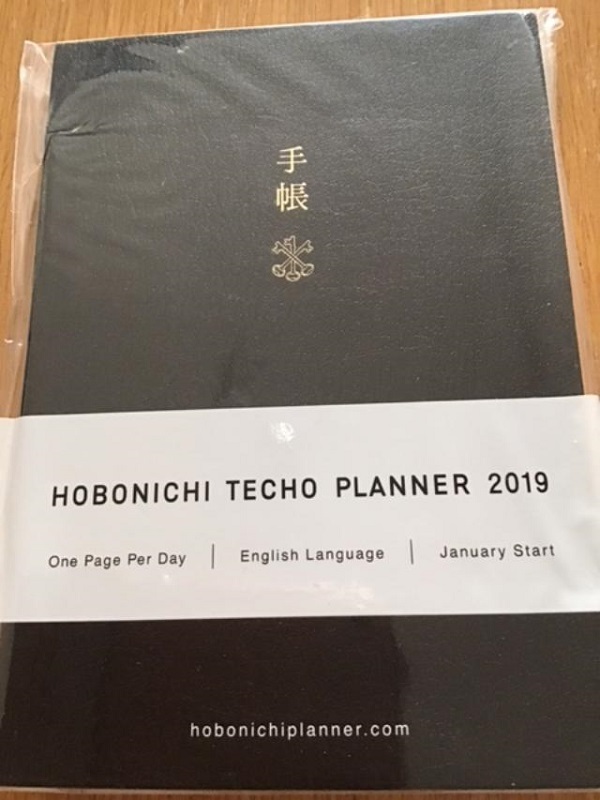 The Techo is a Japanese planner which is used for more than scheduling, it's also used for sketching and chronicling daily life. I just hope that I can keep up with jotting something down each day. A roundup of the things I'm working on at the moment. I've only finished one of the things I was working on last month, the Knit Baby Jacket by Yarnspirations Design Studio. As I finished the Knit Baby Jacket I cast on another little cardigan for Eleanor's friend's baby. I've gone for a short sleeve one this time as it will be summer by the time she grows into the 6-12 month size. This is Autumn Leaves by Nikki Van De Car. I'm using Knit Craft yarn which I picked up in Hobbycraft in the Lemon colourway, though it's a more saturated yellow than the name lemon would have you believe. It was only £1.50 for 50g and though it's nice and soft, it is a little bit squeaky being acrylic. I should add that I don't find all acrylic yarn squeaky, the Sirdar Snuggly which I used for the Knit Baby Jacket was lovely to knit with but I suppose you get what you pay for, it was more expensive than the Knit Craft. I've now finished one of the socks I'm working on for Eleanor. Socks don't usually take me long to knit but I haven't been picking my knitting up as much as I usually do, and I've also been working on other things so they're taking longer than normal. Eleanor won't mind, she's got plenty of other socks she can be wearing in the meantime. A little bit of work has been put in to my commercial yarn scrappy blanket. I have two on the go, the other is made up of squares from hand dyed yarn. It's been a while since I've picked either of them up to work on but I really enjoy adding the squares so I need to make more of an effort with them. I've given myself permission to put the cardigan I'm knitting for myself to one side for now, I'm not enjoying working on it at present so I'm hoping that absence makes the heart grow fonder. We'll see. I love having flowers in the house, especially at this time of year when there isn't much blooming outdoors. They do cheer me up whenever I glance at them. I start the year off with daffodils, they're a favourite as they're such sunny flowers and cheap as chips to buy in the supermarket. I love them at the bud stage when they offer so much promise of what's to come. They don't take long to open up. I usually buy a couple of bunches and cram them all together in one vase as I think they look lovely en masse. Hyacinths have a very strong perfume which some people love and others can't stand. I'm in the love camp, though I'm in the minority in our house. I have to stand my ground when I pick up the pre planted bulbs in the supermarket as Mick isn't keen. Here they are just at the start of their blooming period. And this is what they look like once they're in full bloom, so many individual flowers making up each stem. Another favourite are tulips. They're in the shops soon after Christmas but I usually wait until I've had my full daffodil enjoyment before moving on to these. I just love the array of colours that they're available in, it's so hard to make a choice. I can never resit taking photos right inside the flower, it's like a kaleidoscope. I have an amaryllis growing at the moment. This was bought prepotted just after Christmas. Sometimes the flower stem grows without any foliage showing itself but this time there's plenty of leaves. So far it looks as though there's only going to be one flower stem, though others can pop up later so that might happen. Usually, I dispose of an amaryllis bulb after it's flowered but last year I thought I'd save it and see if I could get it to flower for a second time. I repotted the bulb not long before Christmas and it's taken quite some time to get to this stage. No buds as yet, just leaves, so I'm waiting to see what happens. 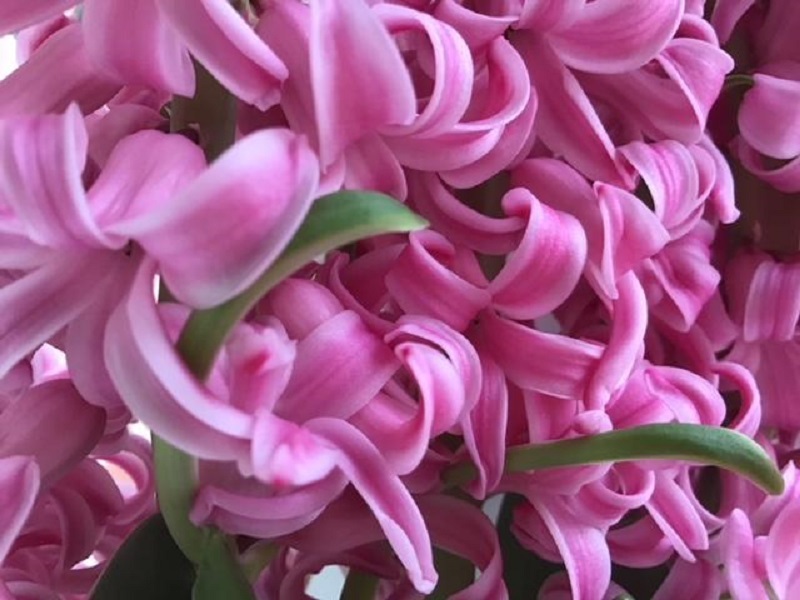 It's a great time of year for cut flowers and indoor spring bulbs. I noticed that stocks are in the shops now so I might treat myself to some this weekend, especially as I wasn't treated to any flowers for Valentine's Day. Oh well, it just means that I'll have to treat myself instead. It was windy on Sunday but nowhere near as windy as it had been on Saturday so we got wrapped up and took Archie for a good walk at Lotherton. The sun kept trying to put in an appearance, but so did the rain, though there were only a few spits. The hall itself is closed during January and February for cleaning but they still offer guided tours. We only go inside if we don't have Archie with us, so that isn't very often. This little chapel dates back to the 1100's and services are still held there. Dogs must be kept on leads in some parts of the estate so we always have a walk through the woods so that Archie can have a good wander and sniff about without being confined. It's nice for him to have a bit of freedom, he's always good and never tries to run off. It's quite muddy at the moment so we kept mainly to the paths. The wild garlic is just starting to poke through the ground and when I accidentally stood on a shoot the pungent scent filled the air. There's lots of moss covering fallen trees, I think they look attractive. When you look at moss really closely it's like looking at a miniature world. Someone's been den building. I remember building dens myself when I was a child. We had a small common at the bottom of the street where I grew up and I'd spend hours there with friends. We had lots of fun making dens, climbing trees and playing hide and seek. Can you see the face on this tree? A leftover from Halloween I believe. There was the outline of a bat on another tree. There's lots of leaf litter covering the floor. Archie loves to run through fallen leaves, I think he enjoys the noise they make. This garden is known as the William and Mary garden. It has a sunken pond which is a favourite with children, especially at frogspawn time as it usually fills up with tadpoles. There's a door right at the end of the wall which leads through into what used to be the kitchen garden. There were quite a few people about on Sunday, particularly in the children's playground. The weather can keep families indoors during the winter months but a whiff of anything close to a fine day brings them out so that children can let off steam and adults can breathe in some fresh air. We're lucky to have a choice of places close by where we can exercise Archie and enjoy our surroundings. Lotherton is a great place to visit during summer but there's plenty to see and do there during the winter months too. 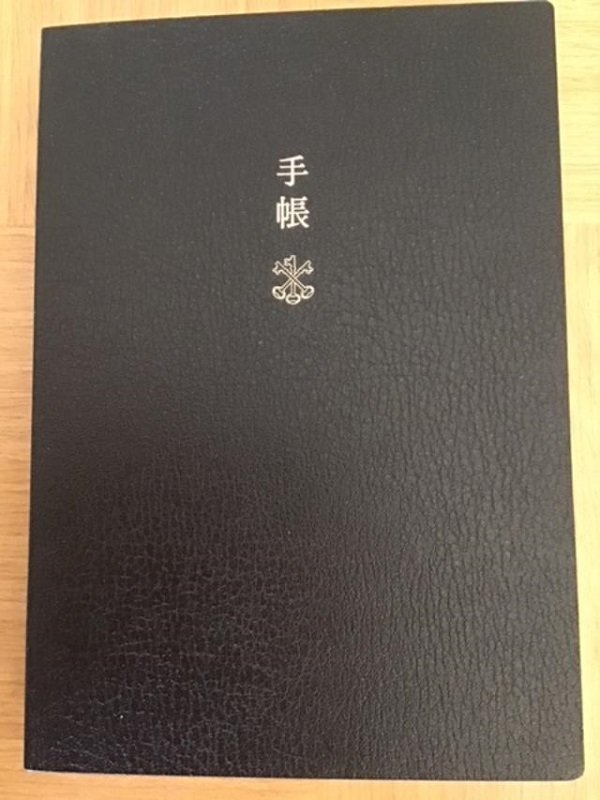 I've posted a few times previously about my Filofaxes, my most popular post being A Tour Of My Filofax Crimson Malden which I wrote back in 2014. I found a binder I love in my Malden and a planning system which works for me so little has really changed since then but I thought I'd do a little updated tour anyway. I actually use two Filofaxes and I also have an A4 size journal so I'll show you around each of them. My Malden is personal size and has been in constant use since 2013. I wrote about buying it in my It's Here post. As you can see, six years of constant use is now showing, it's more bashed about and worn in than in either of the two previous posts I've mentioned. I've used leather cleaner on it but it doesn't really lift the dirt, I don't know what else to try. Inside the cover are slots for credit cards, though I don't keep any bank cards in here myself, I use these pockets for business cards, stickers, notes, etc. The diary I use is a week on two pages. I always buy the lined version, it keeps my writing neat and tidy, though there wasn't much going on during that first week of the year. I use a Bic four colour pen and colour code my diary, black for general, red for appointments, green for holidays and blue for birthdays. I used to use a second pen with a further four colours when Daniel and Eleanor lived at home as I had more categories to keep track of but I've managed to streamline things since then. These are the tabs in my Notes section. My To Do list consists of little things that I'd forget about if I didn't write down. I don't list everyday jobs, just the things which I don't ordinarily do. The same for Shopping, I don't write a shopping list but I keep a note here of anything out of the ordinary that I don't want to forget to pick up whilst I'm out. I also keep a note of things I've ordered that I'm waiting for here too. I don't speak to Daniel and Eleanor every day so I keep track of anything I want to ask or tell them when I do speak to them. I also keep some sticky notes in the Notes section, I use these a lot if I need to jot something down, they're really handy as I can lift them out and move them to other sections. The Project section contains notes about my blog, I don't really plan posts but I jot down ideas here. I often set myself little challenges and keep track of those here. The Information section is quite busy, there's everything here from holiday planning to information about holidays I've already taken, the books I've read this year and books I want to read, even a list of the charms which Eleanor's got on her Pandora bracelet so that I don't duplicate any. I use a different planner for household finance so the Financials section is more about personal spending and Eleanor's student finance and accommodation fees as well as information about Archie's vets fees. The A-Z Address section speaks for itself but I also keep lists of books in this A-Z section too. I have a list of all the books I've read during the current year in my notes section but I keep lists by author's name of all the books I've read since I started keeping a record back in 2012. I have a clear pocket right at the very back where I used to keep coupons but I don't take my Filofax out and about with me any longer so I don't use this any more. There's two pockets in the back of the Filofax where I keep bits and bobs. I've left out the personal information but you can get an idea of how I use this Filofax. On to my Chameleon which is A5 size, I use this for household and financial information. The credit card slots inside the front cover hold business cards from people who have done work on the house for us, it's good to have their numbers handy. The first section is banking. I have a list of everything I need to pay each month, either by direct debit or an amount I put aside for things such as petrol, Christmas or housekeeping. I keep a running tally of what's coming in or going out of the bank accounts. The next section is where I keep a note of which utility suppliers we're with, the deal we're on, when it ends, how much we're paying etc. I also keep notes here of household appliances we buy, the model numbers, how much they cost, where we bought them from and the date etc. I also have a Christmas section in this Filofax where I keep my Christmas card and present list. I keep a record of what we've bought, when, who for and what it cost. There's a credit card wallet at the back and a pad, though I don't use either of these. Again, there's a lot of personal information in this Filofax so there isn't a lot I can show of this but it will give you some idea of how I use it. I've been using an A4 notebook as my journal since 2006. This book is undated so I write in it as and when the mood takes me but I've been reconsidering the way I journal just lately and have come to a decision. More on that at a later date. Nikki from Notes of Life blog made this beautiful leather Traveller's Notebook for me last year. You can read all about it in my Traveller's Notebook post. I must confess that I still haven't started using it, I'm still considering the best way to add this into my current planning system. I've got a Homecube which holds some of the pens and stationery I use. It doesn't hold everything though, I could definitely do with more storage. I hope you've enjoyed this little tour of my planner system. Tell me, do you use a planner? If so, what type of planner do you use?